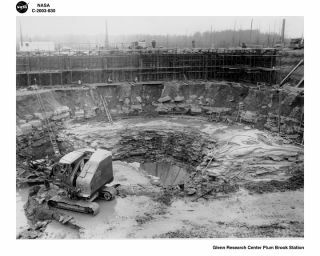 The Plum Brook Reactor facility started with a hole in the ground for the pressure tank. In this historical photo from the U.S. space agency, the beginning of the Plum Brook Reactor Facility construction is pictured when crews excavated a hole in the ground for the pressure tank. The tank extended approximately thirty-two feet underground. The steel containment vessel, which was more than 100 feet high (fifty-five feet above grade and fifty-six below grade), surrounded the reactor tank area and the surrounding quadrants and canals. It was designed to prevent any radioactivity from being released if an accident were to occur in the reactor. This safety precaution was essential because of the nearby communities. Many other large reactors did not have such safety features. For example, the Materials Test Reactor in Idaho Falls had no shield because small amounts of contamination could be released into the atmosphere without endangering the public.